Butter (German: "die Butter") is made from butterfat in the cream of cows, sheep, and goats (and sometimes other mammals). The butterfat (also known as milk fat) is found in small, round globules surrounded by a membrane of phospholipids and lipoproteins. The lipids or fats point into the center of the globule, while the phosphates or proteins like the watery liquid outside of the globules. This makes the tiny balls (0.1 to 1 micron in diameter) very stable. When churned, the cream becomes foamy (whipped cream), which means air bubbles form and fat globules line the air bubbles. If they are hit together for longer and at a higher temperature (55-65 F) than when making whipped cream (about 40 F), the globule membranes break apart and coalesce with other globules. Agitate enough and the fat globules in water emulsion invert and become water molecules in fat, which separates from a larger part of water and milk solids (whey). With carefully controlled cooling and more churning during this time, the butter becomes a large amount of amorphous fat, with less water, smaller groups of milk solids and few, leftover globules. This is what makes butter smooth and creamy and not stiff and crumbly. The butter is separated from the buttermilk and the butter can be washed to improve its keeping properties. Then it is salted (if making salted butter) and worked to improve consistency. For more on this, please look at the USDA's Butter Exhibit. US and Canadian regulations call for a minimum of 80% milk fat in butter, with most companies producing butter with an average of 81% milk fats (80-82%). German regulations, on the other hand, stipulate no less than 82% milk fats (or butterfat) and butter is often produced with up to 85% milk fat. Germany also sells more cultured (sour) butter, but most of the butter in North America is sweet cream butter. 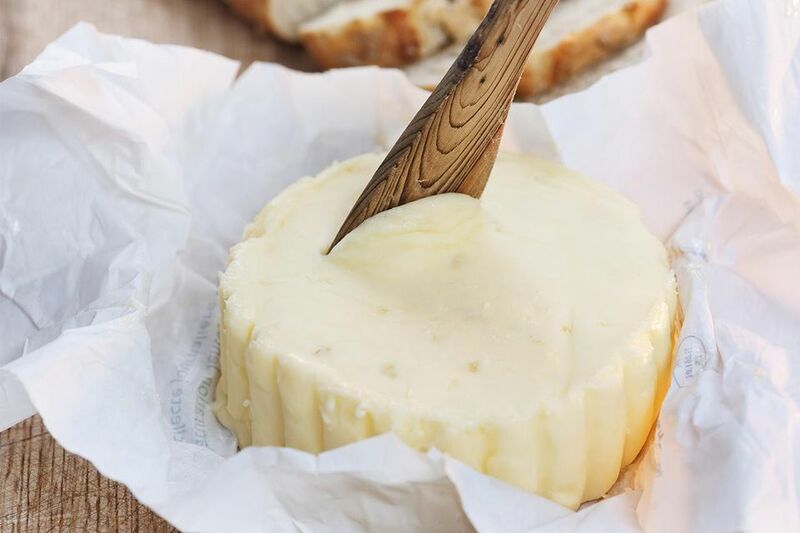 Cultured (soured) butter, or European-style butter ("die Sauerrahmbutter") is made by incubating the cream for about 16 hours in the presence of bacteria specifically grown to sour milk products (as when you make quark, yogurt or sour cream). After incubation, it is churned in the usual fashion. The pH of this butter must lie between 5.1 and 6.4. Another type of European-style butter adds the bacteria after the butter is churned and is called "mildgesäuerte Butter" in German (mildly soured butter). Because much of the liquid has already been poured off, the product is smaller and takes less room to incubate, saving the company money. This butter must have a pH of less than 6.4, which means it is less acidic (less tart) than the "Sauerrahmbutter" mentioned above. Bakers usually prefer butter with a higher fat content, especially for puff pastry and laminated pastries. They also want unsalted butter so that they can control the salt content in their baked product. Salt content in salted butter (both sweet and soured cream butter) can vary from 0.4% to 4%, depending on the manufacturer. Salted butter is usually preferred at the table and for finishing dishes. Sweet cream butter is better for binding sauces, since it does not curdle as quickly as cultured butter and seems to bind better. Whether you prefer the taste of sweet or cultured butter depends on where you grew up and what you like. Many Americans find cultured butter to be a bit too tart because they grew up with sweet cream butter. North American butter (see image) for consumers usually comes in long, narrow, wax paper wrapped packages of 4 ounces each (about 100 grams). In the western United States, the sticks may be shorter and fatter. Butter dishes are made to fit this size of butter. In Germany and most of the European Union, butter is packaged in 250 gram (about 9 ounces), foil-wrapped bars, much like the cream cheese in the US. Here is a picture of German butter in a German butter dish. There are several manufacturers in the US which produce European-style butter. Organic Valley European-style cultured butter - 84% butterfat. Plugra - 82% butterfat - sweet cream. Vermont Butter and Cheese Creamery - 86% butterfat - cultured, with an online store. Most of these products are found at natural food stores such as Whole Foods Market or Natural Grocers. Plugra can occasionally be found in regular supermarkets. "Butterschmalz" is clarified butter or butter which is melted, allowing the water to boil off and the milk solids to separate. Skim the milk solids from the top and what is left is clarified butter. It keeps longer than butter and does not burn as readily when high heat is used. There is a product in Germany called "Butterschmalz" which is some sort of butter-flavored shortening. Perhaps butter-flavored Crisco would be a good substitute. Ghee is like clarified butter, except that the milk solids are allowed to brown, giving the fat a light nut flavor. If you are short of time, use half butter, half oil in any frying or browning step as a substitute for "Butterschmalz." The oil keeps the butter from burning but retains its flavor.